and espionage; they had a potential U.S. decision to block delivery to Turkey of arms systems, including the F-35 stealth fighter; they had potential U.S. sanctions on a Turkish public bank; the U.S. had doubled tariffs on Turkish steel and aluminium; a Turkish boycott on U.S. electronics; major differences over Syrian Kurds; and Turkey’s persistent demands for the extradition of Fethullah Gülen, a Muslim cleric who is Turkish President Recep Tayyip Erdoğan’s political nemesis, living in self-exile in Pennsylvania. What has changed so radically in three months to lift up the relationship from its worst tensions in decades to such warmth? Not much. 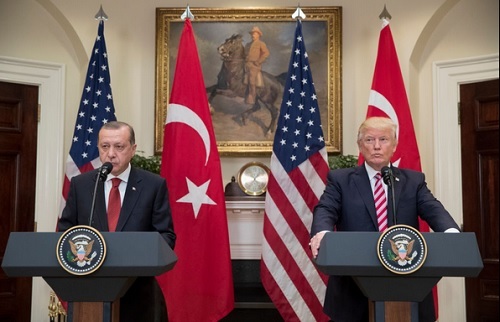 Under U.S. pressure, Turkey released Pastor Andrew Brunson; Turkey’s currency, the lira, has since steadied, and there is no more Turkish talk of an American “economic warfare.” Yet Ankara and Washington still have a rich menu of problems to be resolved. Washington has not had an ambassador in Ankara for more than a year now, a first in the modern history of U.S.-Turkish relations. But there is more. According to the Greek magazine Hellas, U.S. officials say that Turkey’s planned acquisition of the S-400 system could potentially trigger actions under the Countering America’s Adversaries Through Sanctions Act (CAATSA), and have “serious ramifications for US ability to do business with Turkey across the defense trade spectrum.” Turkey insists that the S-400 deployment in the country will start in October 2019. It is still unclear if the U.S. will sanction Halkbank, the Turkish state bank accused of violating U.S. sanctions on Iran. Markets remain anxious over a penalty worth billions of dollars that could seriously damage the bank’s liquidity position in particular, and the Turkish banking system in general. Syrian Kurds remain an issue. Turkey and the U.S. differ on the Kurds. Both countries view the Kurdistan Workers’ Party (PKK) — the main Kurdish separatist group — as a terrorist organization. Turkey also thinks the People’s Protection Units (YPG) is PKK’s Syrian branch, and insists that it should be listed as a terrorist organization. The U.S. thinks differently about the YPG, which has worked as a U.S. ally in the fight against Islamic State. The U.S. offer of a reward of millions of dollars for information on the location of three leading PKK figures cautiously pleased Ankara because Turkey thinks the move is against PKK, not YPG. Although Ankara said it was pleased by the American reward offer to help capture three top Kurdish PKK militants, most Turkish security officials believe the move was a U.S. effort for public diplomacy, aimed at eventually driving a wedge between the PKK and Syrian Kurds. “We think this [the U.S. reward offer] aims to finally legitimize the YPG,” one senior security official told this author on November 17. Turkish Defense Minister Hulusi Akar said the U.S. reward offer was a positive but a “very, very late” step, and called on Washington to adopt the same policy towards the YPG. “It is not possible for us to accept putting a bounty on PKK leaders on the one hand, and sending trucks of tools, weapons and ammunition to the YPG on the other,” Akar said. On top of that exhausting list of disputes for the Turkish and American diplomats to resolve remains the issue of Fethullah Gülen, the Muslim cleric who was once a staunch ally of Erdoğan. Gülen, now, however, is accused by the Turkish government of being the mastermind behind the failed coup of July 2016. Since then, the Turkish government has been seeking his extradition from the U.S.
All this means is that since the summer, things have not come up roses on the Washington-Ankara axis. Most of the problematic issues remain unresolved. The future actually looks potentially gloomier as the future of Syria shapes up, and Erdoğan might well switch back to more radical anti-Western rhetoric ahead of critical local elections in March.